Cool - my cheese sandwich hack is up at Parent Hacks! I don't know why that tickles me so much. By the way, the original post was called Cheese Swanwiches because that's how Miss M. pronounces "sandwich". Swanwich. The "swan" part rhymes with "tan", or "sand". Last week, City Mama had a post about her four year old daughter transitioning to a new preschool, and coming home on the first day to announce that she hated the school. Because they didn’t get to play. But really because they had to do a worksheet. City Mama went on to talk about the prior “hippie” preschools that her kid had been to, with no worksheets. The comments on the post had a lot of interesting stuff about hippie preschools and worksheets and structure and play and what’s appropriate for a little one. It got me thinking about my child’s daycare. It certainly swings towards the hippie end of things. It’s a formal daycare center, for kids from 18 months to 5 years old. It kind of transitions into preschool – the kids can stay there until they go to kindergarten. They get a lot of learning done there – but it’s all in the interstices, nothing overt. They read books, sing songs, dance, play dress-up, play with plastic bugs, feed the fish, play outside, help with snack and lunch, paint, play with clay, learn to share, to interact, to empathize and sympathize, etc. It’s a wonderful, warm and caring environment, and I feel very lucky that we found it. One of the people who commented on City Mama’s post, Twizzle at Baboon of Magnesia, included a link to a great article called The Worksheet Dilemma: Benefits of Play-Based Curricula. The subhead kind of says it all. The gist of the article is that kids, up to about age 6 (i.e. kindergarten), need to work with concrete things rather than abstract symbols – they’re just not ready to sit down with a worksheet. Kids need to play. My kid brought a book home from school the other day: Naugty Little Monkeys by Jim Aylesworth. It makes me crazy. It's an alphabet book, where each letter equals a monkey. The first stanza refers to "all naughty twenty-six". BUT THERE ARE ONLY 25 MONKEYS. Because letter Z isn't a monkey, but is the ZOO where the 25 bad little monkeys go at the end of the book. Besides, the poetry is terrible and most of the stanzas don't scan right. 2. Avoid even those food products that come bearing health claims. 3. Especially avoid food products containing ingredients that are a) unfamiliar, b) unpronounceable c) more than five in number — or that contain high-fructose corn syrup. 4. Get out of the supermarket whenever possible. 7. Eat more like the French. 8. Cook. And if you can, plant a garden…So you might want to think about putting down this article now and picking up a spatula or hoe. I laughed when I got to item #8 - yesterday, I made 4 quarts of chili, 2 1/2 quarts of barley soup, a batch of granola, a loaf of whole wheat bread with cinnamon/sugar/butter swirled up inside, and a batch of the no-knead bread (which is still rising). I think I did my share of spatula-lifting yesterday. I knew it was time to clean house because I caught my 3 year old testing the laws of physics by dropping dust bunnies over the balcony and down the stairs. I’ve just finished reading Michael Pollan’s book “The Omnivore’s Dilemma”. [Check that link - you can download a pdf of the introduction and first chapter there.] The book is a fascinating tour through eating in America, and what one’s choices in food mean in a larger context than a personal one. “Natural raspberry flavor” doesn’t mean the flavor came from a raspberry; it may well have been derived from corn, just not from something synthetic. In order of diminishing corniness, this is how the laboratory measured our meal: soda (100% corn), milk shake (78%), salad dressing (65%), chicken nuggets (56%), cheeseburger (52%), and French fries (23%). The food industry burns nearly a fifth of all the petroleum consumed in the United States (about as much as automobiles do). And elsewhere there is a description of battery egg layers that is shocking. Salatin reached down deep where his pigs were happily rooting and brought a handful of fresh compost right up to my nose. What had been cow manure and woodchips just a few weeks before now smelled as sweet and warm as the forest floor in summertime, a miracle of transubstantiation. As soon as the pigs complete their alchemy, Joel will spread the compost on his pastures. There it will feed the grasses, so the grasses might again feed the cows, the cows the chickens, and so on until the snow falls, in one long, beautiful, and utterly convincing proof that in a world where grass can eat sunlight and food animals can eat grass, there is indeed a free lunch. In a lot of ways, Pollan’s book overlaps with Marion Nestle’s What To Eat (which I read last spring) and Eric Schlosser’s Fast Food Nation (which I read when it came out). But I think the third was the charm. The short story – I will change the way we eat. I’ve signed up for a CSA program for next summer at Roxbury Farm. We’ll get a box of organic vegetables every week. We're making a much more concerted effort to get locally raised meat. I'm lucky in that my office is very close to the Union Square Greenmarket, so I have access to local produce (including eggs and meat). I tend not to buy a lot of processed foods anyway, but we'll do better on that front. It's my new year's resolution, even though the year is nearly 1/12th over. Mir, on Want Not yesterday, had a link to a questionnaire/survey called Why Do You Blog?. It's a good question. Out of nowhere one day last summer, I started this here blog. And now it feels like it's in some kind of perpetual motion...one thing leads to another and all of a sudden there's a whole pile of draft posts. And lists of other ideas for posts. And posts drifting around in my head. The stuff just wants to come out. And the stuff is all over the place - hence "magpie" "musing". I am really doing this for me, but it pleases me when it pleases others too. Thanks to Megnut, I read today about an organization helping African babies by shipping expressed breast milk to them. I never had enough breast milk for my own baby, and had to supplement, but the idea of pumping and donating is a selfless one with tremendous payback. Good karma. I love biscuits, and I find that they amplify and complete a simple meal, like the "porky pea soup" I pulled out of the freezer last night. 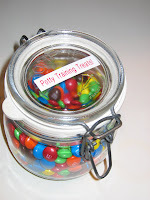 [Yes, that's how W. labeled it when he put it away, and it was indeed porky.] But most biscuit recipes make far too many for our little family of two adults and one unpredictable child, and since they're best right out of the oven, I don't like to have leftovers. So, I've finally perfected a recipe to make biscuits for two (or three). It uses only one cup of flour, and makes about six biscuits. I've given a couple of options - one for the leavening, one for the liquid. I've had a can of Bakewell Cream in the cupboard for awhile, along with a can of buttermilk powder in the fridge. If you have either, use - otherwise, don't. The somewhat unorthodox baking method works beautifully and comes from the back of the Bakewell Cream can. Mix all dry ingredients together (this includes the buttermilk powder if you're using it). Cut butter into smallish pieces, about 1/2" chunks, and add to the dry ingredients. Using your fingers, toss the butter to coat with flour, and quickly squish the butter pieces to flatten. Work quickly so the butter doesn't melt from the heat of your fingers, and keep squishing until all the butter is in nice little pieces. Quickly add the liquid (water or milk). Stir with a butter knife until it comes together. Using the knife, carve out five or six lumps of dough and place on a non-stick pan. Pat them if they're too unruly looking. They should be about 3/4" thick. Bake for five minutes at 475° F. When the timer goes off, turn off the oven and leave the biscuits in the oven for another 10 minutes, until golden brown. *Bakewell Cream is a substitute for cream of tartar - when combined with baking soda, it becomes like baking powder. Here's a good explanation. The Bakewell Cream makes really fluffy biscuits - they rise better than those made with regular double-acting baking powder. What possessed me to try and make a hat out of "fur" yarn? Argh. I cast on and started knitting, decided that the cast on was too tight and spent about 20 minutes unraveling it. The fur ties itself in knots. Argh. Once I got going, it was okay - but if there are any errors, I'm not fixing them! When I was a small person, my mother used to take me to the ballet. Not only did she take me to performances, she took me out of school to attend open rehearsals and the like. Little did I know that Jerome Robbins had already made that ballet - in 1953. He called it Fanfare. 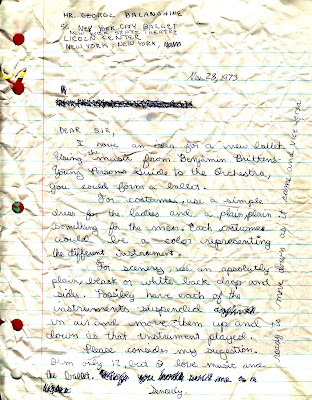 I never got a response to my letter. 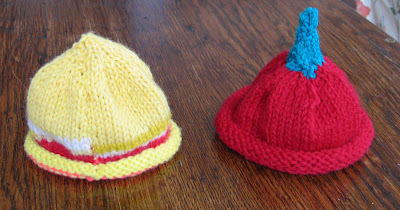 I made two more hats! The one on the left used a mess of little scraps of yarn, and was knit flat and sewn up. I'm sending it to the local NICU. The one on the right was my first attempt at using a circular needle (and switching to double-points for the decrease at the top). I think it's charming and I'm going to give it to a friend who's about to have a baby. I bought more yarn today. I've been reading Michael Pollan's book, An Omnivore's Dilemma, and scratching my head at his use of "beeve". I could figure out what he means from the context, but it's peculiar enough (to me anyway) that I finally looked it up. In addition to being the meat from a cow/steer/bull, a beef IS a cow/steer/bull. The plural of a beef is beeves. Granted, it's archaic. But odd, no? Especially because Pollan uses the singular back-formation "beeve" to refer to a single cow/steer/bull. And just in case you were wondering, the meat of a pig is called pork, but "the pork" is not an archaic equivalent to "the pig". The pork is something that gets doled out in Washington and Albany. Apple Clafouti is the other Julia Child recipe from last month's Christmas Meme. This is also from Mastering the Art of French cooking, but it's the one from Volume 2. She has clafoutis in both volumes. Clafoutis (more and more spelled "clafouti" these days - perhaps because the "s" makes the word look plural to American eyes) is usually considered a dessert. From the Limousin region of France, it is traditionally made by filling the bottom of a buttered baking dish with stemmed but unpitted black cherries, covering these with a batter, and baking this in an oven. The result is a custardy, slightly puffed, lightly browned confection, dotted with pieces of the soft, fresh fruit. It is eaten warm or cool, dusted with powdered sugar." This is a wonderful, simple dessert. It's rich but not cloying, and leftovers are perfect for breakfast - all that egg, you know. Mix currants and rum and let stand. Drain the currants (reserving the rum) and pour half the rum over the apples. Beat eggs and sugar until thick and yellow. Add flour, rum/cream and cinnamon. Add currants. Pour over apples and bake at 375° for 25 minutes. This begged a few questions for me. Did anyone know she was pregnant? Do chimps have the same propensity towards genetic abnormalities in the babies born to older moms that humans do? Did she have any prenatal testing (amnio, CVS) given that she's of advanced maternal age? Or is that not advanced maternal age for a chimp? And if they did do genetic testing, and did find an abnormality (is there a chimp equivalent of a trisomy? ), would they have done anything about it? The mind reels. Months ago, I cleaned out a dresser at my mother's house, and found a trove of diaries and journals and notes from junior high school. Notes meaning: little tiny scraps of paper in handmade envelopes, all from one friend of mine, named Ann. We passed these back and forth with great regularity, discussing friends, boys, teachers. Last night, I sat in front of the fireplace, reading them whilst drinking wine, and burning as I went. I saved some of the best of them, and there's one journal that I didn't get to. Today I learned how to convert from F° to C°. I didn’t write the past two days because I was busy but Friday I did relatively nothing and Saturday I went to Gigi’s*. We went to the park to have Gigi’s picture taken. Some dumb lady thought I was her kid. She’s 63 and I’m 13. God, some weird lady. Saturday night, Mom and Pop had a party. Boring. Nothing, literally, happened on Tuesday! The oh-so-scintillating inner life of a 13 year old. * Gigi was my grandmother. She lived nearby, close enough that we could bicycle over to her house for root beer floats and the cookies that were always in the pantry. I bring my daughter to work periodically. I brought her in in December, so she could be at our office Christmas party. We went in a little late, so she didn't have to be there ALL day. I brought DVDs and other entertainment, we went out to lunch together (ah, macaroni and cheese), she did errands for me (took checks down the hall to be countersigned, and even brought them back), we Xeroxed her hand - you know, all those kid-in-the-office things. She's been coming to the office since she was tiny. I started back to work (that is, back to work IN THE OFFICE*) one day a week when she was two months old, and brought her in on those days. Then it was three days a week, and she came two of them. Then, at about four months, I was back in the office full time, and she came every day, and we had a babysitter who worked half time out of the office. Every morning, I'd strap her into the Bjorn, and take her to work on the subway. I'd arrive at the office at 10, hand Miss M. over to Norma, and Norma returned with her at 2. Sometimes they went out, sometimes they stayed in the building. From 2 to 6, Miss M. was with me, or sleeping, or being passed around the staff. I had a pack 'n play and a stroller and a bouncy seat and an exersaucer and other assorted baby needs parked in an unused area of the office. When she was 8 1/2 months old, we moved to the suburbs and I couldn't keep bringing her to work. Besides, she'd started crawling and it became untenable. The point is that everyone in the office knows her pretty well. The day after the Christmas party, my boss was talking about her - her personality, charm, smarts - in short, about how great a kid she is. She is a great kid, and I'm often amazed at how outgoing she is. I don't think of myself as outgoing at all, though I'm certainly better than I used to be. So I rolled my eyes like "where'd she come from?" And he says "Plant a potato, get a potato". At first I thought: he's calling me a potato? But then I realized that it was an odd little compliment to me - my smart and charming daughter is that way because I am. Or because he thinks I am. Or whatever. It was actually a really sweet thing. "Plant a potato, get a potato." * There was not one day of my maternity "leave" that didn't include a call from my boss or someone else in the office, and every week, they messengered a package of mail and checks and other things to look at and/or do. I'm not complaining - I was on full salary the whole time, and it kept me in the loop so coming back wasn't too hard. P.S. That picture? 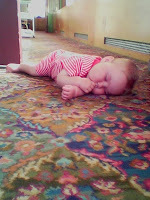 Miss M. asleep on the floor in the corridor outside of my cubicle, about 7 months old. She'd crashed there, and people had to step over her. If your ringtone is annoying everyone around you, maybe you need this one by John Cage. Doesn't it sound ugly? I've always thought pulchritude just seems like it must mean something icky, ugly, not nice. It's a noun, meaning physical beauty (especially of a woman), per WordNet. And the adjective form is pulchritudinous. I think you have ruined Curious George for me. Everytime I read it to Miss M., and get to a spot where GEORGE is in capital letters because he’s a bad little monkey, I think of you and your George. Argh. Earlier this month, I placed an internet order for some flatware as a gift for my recently married brother. I ordered 12 place settings on behalf of my mother, and the completer set for myself to give, and had everything shipped to my mother’s house. We were appalled to find out how much you charged for shipping – frankly, it’s price gouging. The package, according to the UPS tag, weighed 14 pounds. Using the calculator on the UPS website, that package should cost $9.96 sent ground from 60540 to 11050. Yet, you charged us $59.84 – a sixfold markup! Gouging. Sorry, no other word for it. I think you should be ashamed of yourself. My mother was sputtering – as she put it, she could have taken a cab and back to the Manhasset store for quite a lot less than that (she is unable to drive as a result of a medical condition). I thought I was doing us both a favor by having the flatware delivered to her house – but in fact, I caused her and myself a great deal of unnecessary unhappiness at the state of the universe as a result of having placed the order on-line. I would appreciate a refund of $50 – the approximate difference between the actual shipping cost and the price that you charged me. I look forward to hearing from you soon. On Thursday, 4 January, I came home to find a voice message from Crate & Barrel customer service explaining their shipping rates, and crediting my account for the $50 I requested. The woman said that shipping of orders over $200 was charged at 10% of the order, but that customer service would take circumstances into account. In other words, complaining may well get you a reduction on the shipping. She didn't apologize, but I did get my money back. My small daughter received the enclosed scepter (and a tiara) last weekend for her birthday. Within hours of receipt, one of the rhinestones had fallen off and the head had broken off the stem. It was not being bashed around at all. She is enormously disappointed – could you send us a new one? Result - new scepter AND tiara by mail. Okay, you probably know panache as "flair" or "je ne sais quoi" - you know, he had that certain something. (n) dash, elan, flair, panache, style (distinctive and stylish elegance) "he wooed her with the confident dash of a cavalry officer"
In other words, did you know a panache was the thing on the top of your hat when you were in the marching band in high school? Last month, in the Christmas Meme, I referenced two favorite recipes from Julia Child. In a small heavy-bottomed saucepan with a lid: cook garlic slowly in 4 T. butter - covered - for about 20 minutes until soft but not browned. Add flour and stir over low heat for 2 minute. Off heat, stir in milk, and salt, and pepper to taste. Return to heat and simmer for 1 minute, stirring. [Julia then has you put this white sauce through a sieve or puree it in the blender – I never bother.] Set aside. Boil the potatoes in salted water until soft. Drain and mash them. Return to pan and stir over low heat for a few minutes to evaporate some of the excess moisture. As soon as the potato puree begins to form a film on the bottom of the pan remove from heat and beat in the other 4 T. butter one tablespoon at a time. Add salt and pepper to taste. Beat in the garlic sauce and enough cream to reach the desired consistency. Beat in the minced parsley and serve. It's from Mastering The Art of French Cooking (volume 1) by Simone Beck, Louisette Bertholle, and Julia Child. It's a staple at our family holiday meals - goes with beef, lamb, turkey, goose. It's even good cold, if there's any left. The Apple Clafouti will follow another day. Speaking of my name, check these out. now those are 2 sweet letterforms. Is it any wonder that a line of “m”s denotes “yummy”? Mmmmm. The cap is unique and strong; balanced, and open in a way that doesn’t interfere with other letterforms. The lower case echoes the sturdiness of the cap, with all feet firmly on the ground, but with those 2 nice curves. I’m so glad my name begins with M! Thank you Marian Bantjes! I like M too! Awhile ago I read, on Parent Hacks, of a suggestion as to where to send outgrown toys and such. Asha revisited this today, and included a link to an Army Corps of Engineers story about the distribution of the toys. Over the weekend, I drifted through the house collecting spare stuffed animals (how they accumulate!) and boxed them up. They went in the mail today. It seems so little, but I hope that some children in Iraq will be pleased with their gift. What is going to happen to the bums and panhandlers (and buskers for that matter) when cash disappears? I walked by a guy soliciting pennies for the homeless today, with not a cent in my pocket. Granted, I was on the way to the bank to deposit a check and withdraw some cash from the ATM, but still - not a cent. And we move more and more towards a plastic cashless society. So what becomes of the panhandlers? Following the completion of the hat, I figured that I'd better use up the lovely screaming Orlon yarn, so I embarked on an afghan "square" (it's really a 7" x 9" rectangle) for Warm Up America. By making those wacky polka-dots, I got to practice changing and carrying yarn colors. And I cast on, and off, all by myself. It too is going in the mail tomorrow. I think I need a real project now, with real yarn, and a real goal. I got a hankering to knit something recently. A long time ago, I'd made a sweater, which came out completely strangely. Misshapen and unwearable. So I'd put it aside and didn't think of knitting until a couple of months ago. After kicking it around in my head, I poked around on the web and got inspired to participate in Save The Children's Caps to the Capital. I dug up some old yarn at my mother's house, found my old knitting needles, asked someone in my building to teach me how to cast on again (I remembered knit and purl, but not casting on or off), and made this here hat for a little baby. It borders on hideous, and is far from perfect, but I'm enormously pleased with myself. It's going in the mail tomorrow.